As shadows from the evening sun cover the hills of Central Texas, a day from the not- too-distant past is coming to a close. It is the day of the county fair. Everyone in the community came together to enjoy the social event of the season with their families, friends and neighbors. 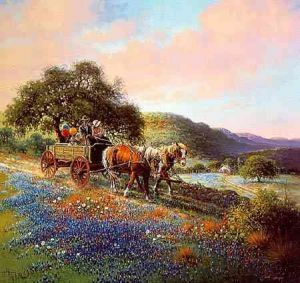 As ranchers in Texas for many years, my grandparents were an integral part of a unique culture. This is a scene as they approach the ranch with their two youngest children, my mother and her brother, returning "Home From the Fair."